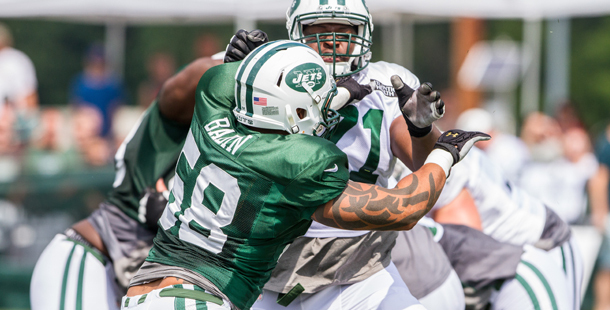 LB Jason Babin signed with the Jets the day before training camp began. He made his first appearance in uniform on the second day of practice and will make his game debut against the Indianapolis Colts tonight within 15 days of agreeing to terms with the team. In the short amount of time Babin has been with us, he has shown his ability to get off the line and pressure quarterbacks. Although he hasn’t been able to hit Jets quarterbacks, he’s made his presence felt, especially at the Green & White practice where he had a number of QB pressures that forced errant throws. Head coach Rex Ryan said Tuesday that he knows what Babin can do in terms of getting to the quarterback but realizes it will take him some time to learn the plays. Babin said there are a lot of intricacies to the playbook that he’s still working out, but in all it’s been a quick transition for him. He added that Ryan and coordinator Dennis Thurman have made the learning easier for him because of the way they evaluate the talent on defense, making personnel calls based on players’ abilities. For Babin, his best skill is finding a way to get to the quarterback and he will be used accordingly. He’s 34 years old, but his production hasn’t slowed down — he recorded 14.5 sacks the past two seasons, including 7.5 with Jacksonville last year. Babin has been around the block, as the Jets are the seventh team he’s played for in his career, but it wasn’t until this season, he said, that he’s seen a group with this chemistry.